Hmmm, a burger is not quite the complete meal without it being served with some fries on the side, and of course, a fizzy drink of sorts as well. 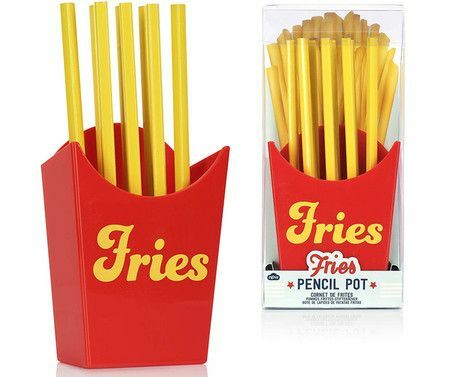 However, if you would want to have something that reminds you of that serving of french fries throughout the day, there is no better way to do so than with the $12.99 French Fries Pencil Holder which will sit firmly in front of you on a desk. The pencil pot has been cleverly shaped like a portion of french fries, where it will not attract cockroaches or ants, and neither will it leave a greasy mess on your hands. Each purchase comes with 8 unsharpened yellow pencils.